Why Seattle — not Silicon Valley — is the gaming industry’s epicenter. We're actually in this info graphic! Zombie College! Winner of Gates Foundation, Facebook education app contest! News Corporation launches Noah's Ark for Facebook. Noah's Ark gets reviewed. "One part farming simulator, two parts animal collecting, and a dash of exploration for good measure." Read about the first wave of developer partners for hi5's enhanced game portal. More of how we helped out hi5 as a featured partner. Detonator Games makes the evening news during PAX. Talking about the Seattle games industry with Brier Dudley. Matt and Corey share their vision for the company. An interview with the UK press HERE. An in-depth discussion with our friends over at WarCry! Check out this interview. MMORPG Italia was one of the first to interview us as a new company. Grazie! Geek cred +4 by getting picked up by Wired! 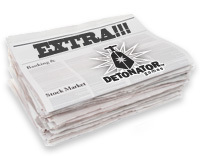 Early news of the formation of Detonator Games. Here's how the cat got out of the bag. Matt Wilson was an "executive speaker" discussing new trends in interactive media. We're very involved with Enterprise Seattle's Startup101 sessions. Learn more.